Keynes’s biography is emblematic. Born in 1883, his father a Cambridge economist and his mother a social reformer, he was a brahmin of the gilded age, but his adult life would be marked by total war and revolution. Though he was in sympathy with the unrest and dissatisfaction then stirring the world, he knew that if the crisis came he would find himself on the wrong side of the barricades. He responded by becoming the ultimate reformist policy intellectual. After Cambridge and two years as a civil servant in the India Office, he began his career as a professional economist by weighing in on the highly contentious question of currency policy in the Raj. He was a conscientious objector during the Great War, but worked at the Treasury managing inter-Allied credit. In 1919 he became famous for his attack on the Treaty of Versailles; Lenin put his book The Economic Consequences of the Peace on the reading list of the Comintern. In the 1920s Keynes pilloried Winston Churchill’s performance as chancellor and denounced the return to the gold standard for delivering a deflationary shock to Britain’s export industries. In 1936 his General Theory of Employment, Interest and Money transformed the debate about economic policy around the world; Keynes reframed unemployment not as a symptom of labour market failure but of inadequate demand in the economy as a whole. During the Second World War he served as a director of the Bank of England, and in 1944 represented the UK and the World Bank Commission at the Bretton Woods conference, which laid out a grand design for the postwar currency system. In an age dominated by the confrontation between organised labour and the hard-faced men of the Tory Party, Keynes remained a member of the Liberal Party until his death in 1946. As he saw it, it was the role of the professional classes to ease society beyond the impasse of class war. There have been many biographies of Keynes and many histories of the ‘Keynesian revolution in government’. Mann’s book belongs to neither category. Nor is it an introduction to Keynesian economics (for the curious, Mann has created a web-based guide to reading The General Theory). Instead, his subject is the politics of the brand of liberal technocracy to which Keynes’s name was attached. From the first, Keynesianism was defined in opposition to an ‘old’ or ‘paleo’ liberalism anchored in individual rights organised primarily around property. From that followed a dogmatic insistence on the freedom to transact on markets, which in turn were to be protected against politics and regulation. The liberty of trade was established as something akin to a religion, with Adam Smith and the classical economists as its prophets. In Keynes’s view, such dogmatism, and the rigidity it fostered, were the opposite of what was needed to secure a progressive liberal order. From today’s standpoint, Keynesianism must also be contrasted with the politics and economics of the market revolution of the 1970s and 1980s, what’s known as neoliberalism. Terminologically speaking, it doesn’t help that Keynes himself would have been quite happy to be described as a ‘new liberal’. In the 1930s and 1940s he engaged in contentious but often friendly exchanges with future luminaries of neoliberalism including Walter Lippmann and Friedrich Hayek. Even on the kindest interpretation, as Keynes saw it, their effort to give new foundations to the market order was a kind of nostalgia, bound to fail in practice. In reality, neoliberalism was more often dishonest, proclaiming its absolute adherence to the rule of the market, only to fall back on massive state intervention. The bank bailouts of 2008 were a case in point. Under modern conditions neoliberalism is, de facto, an anti-democratic politics, which resolves the tension between capitalism and democracy either by limiting the range of democratic discretion or by interfering directly in the democratic process. Keynes’s purpose, by contrast, was to develop a liberalism that wasn’t retrograde, or held in bad faith or anti-democratic, but squarely faced the problem of making capitalism and democracy work together. One way forward was to widen the scope of politics. Keynes, a key figure in the Bloomsbury Group, was a broad-minded cultural modernist. Among the things he thought a 20th-century liberalism should embrace were drugs, birth control and sexual liberation. But in the aftermath of the First World War and the Russian Revolution, with class conflict as intense as it had ever been, it was clear that cultural liberalism had to be accompanied by new thinking about the economy. It had to be reconceived: no longer a sacrosanct sphere of private rights, but an object of national government. Keynes and Keynesianism are so routinely identified with the idea of the big state that it is worth emphasising that Keynesianism is not in general an anti-market politics. To the chagrin of the left, it is not a politics of nationalisation or central planning. Clearly, under the right circumstances markets can accomplish remarkable things. But they do not always function well. And when markets affect the entire economy, like the market for capital or the market for labour, then the consequences when things go wrong are not limited to them, but take the form of systemic, macroeconomic effects. Mass involuntary unemployment was an undeniable reality of interwar Britain. What frustrated Keynes was that the economics of his teachers at Cambridge at the turn of the century had so little to say about it. ‘Economists set themselves too easy, too useless a task,’ he said, ‘if in tempestuous seasons they can only tell us that when the storm is long past the ocean is flat again.’ Economics must address the storm as well as the calm: it must account both for full employment and for chronic and persistent unemployment, the norm and the exception. That was what made The General Theory a general theory. It did not take as read the conditions that made for full employment. It insisted on the need to explain them. In economic terms this involved shifting the focus of analysis away from individual markets towards the circular flow of aggregate demand, production and national income. In political terms it involved undoing assumptions that had become entrenched in the 19th century concerning the proper boundaries between political and civil society, government and the economy. For Keynes, these distinctions were not inevitable. Indeed there was good reason to think that the market economy had an inbuilt tendency to generate mass unemployment, and that under democratic conditions this called the separation of politics and economics into question. Worse, the effort to uphold the old boundaries in the face of economic pressures distorted public discourse and, since it was doomed to failure, risked creating the conditions for revolution. Keynes, as Mann insists, had some sympathy for the advocates of radical change – on occasion he would refer to himself as a Bolshevik – but he was also steeped in the Burkean critique of the French Revolution, which insisted that, however compelling the case for it, revolution must ultimately lead to disaster. The challenge was to steer a course between conservative regression and doomed efforts at revolutionary overthrow. What terrifies both paleoliberals and neoliberals about Keynesianism is the slippery slope. Once the need for intervention was granted, where did one stop? Keynes, as a true liberal, understood that fear. One tempting solution was to transfer decision-making to a technocratic elite; economics would have achieved its true calling, he joked, if it achieved the status of dentistry. But it would be wrong to see Keynesianism as technocracy pure and simple. As Mann says, the point wasn’t, as is ‘commonly said of bureaucratisation or so-called managerial capitalism … to neutralise politics, in the interests of an apolitical society stripped of debate and public life’. Keynesians in fact take a sunnier view. Their ideal is that capitalism and democracy should function together without endangering each other. One way of putting the Keynesian question is to ask how much political intervention in the economy is necessary to build a platform of prosperity stable enough to support democratic politics. The answer lies in what Mann calls ‘Machiavellian’ tactics, in which the boundaries of the political are treated as malleable. The art of modern government does not consist in drawing up everlasting constitutions that permanently demarcate the line between the political and the unpolitical, but in continuously defining and redefining what does and does not need to be governed. A classic instance is Keynes’s argument that if wages are no longer perfectly flexible because of the power of trade unions, and if breaking the trade unions amounts to open class war, then the most convenient means of adjusting real wages to achieve higher employment, and the means least likely to endanger democracy, may be to act indirectly by way of a modest increase in inflation, which reduces the real cost to employers of hiring more labour. Conversely, fixing an exchange rate at an uncompetitive level is dangerous not only because it hampers exports, but because it puts huge pressure on the political system to force through wage cuts. 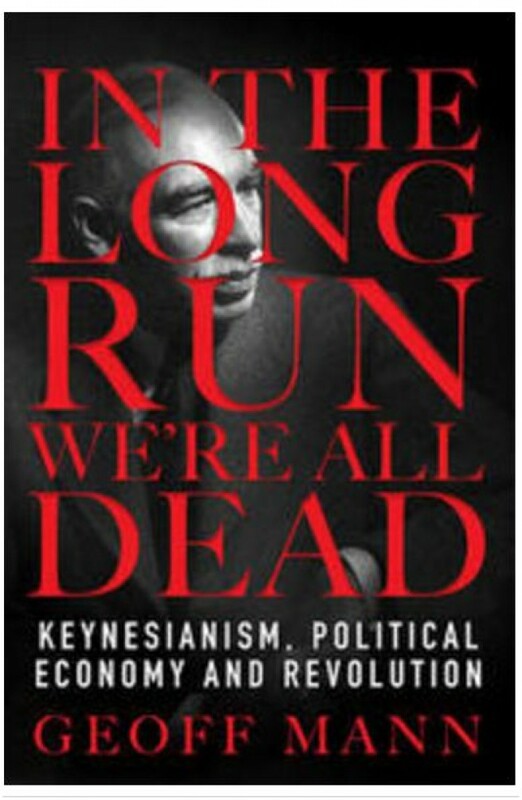 The situational and tactical awareness in Keynesianism expresses itself in a pragmatic approach to time, which gives Mann’s book its title. Keynesianism doesn’t abandon the progressive worldview of Whiggish liberalism; it doesn’t deny that many of the predictions of classical economics may come good in the long run, under ideal conditions, once the various forces have had time to work themselves out. But it does deny that these verities translate into simple rules for action in the present. In the long run the basic tendencies of market equilibrium may well show themselves, but ‘in the long run we are all dead.’ As Mann puts it, it is not in the ‘long run’ or even the ‘medium term’, but in the ‘short run’, ‘the infinite moments of deferral in between, that the problem of maintaining “civilisation” must be undertaken’. It is here that the pressures of necessity make themselves felt. And it isn’t by accident that ‘when liberal government comes face to face with necessity, it “goes Keynesian”’; in other words it ‘acknowledges uncertainty and disarticulation, recognises imperfection and indeterminacy, and turns away from the long run to the immediacy of the moment’. The crisis of 2008 was a classic demonstration of this. What central bankers like Bernanke were asking politicians to do in September and October 2008 had been unthinkable only weeks before. In the end, of course, short runs add up to the long run. To embrace Keynesianism fully would mean abandoning oneself to the flux, without any long-term goal. It would make policy highly unpredictable. The search for ‘credibility’ in economic policy, which has been of paramount concern in the neoliberal era, has been an unceasing battle against governmental discretion. That battle is worth fighting, the argument goes, because trying to govern the economy without having established the general conviction that one is following some fixed principle tends to encourage opportunistic behaviour in the economy itself. The economic deterioration in the 1970s could be understood in these terms, as trade unions and employers contended to protect themselves against inflation, pressuring the government to raise spending, which further increased inflation. So the ad hocracy of Keynesianism is in constant oscillation with more conservative and constrained models of government. One of Keynes’s contemporaries, the Polish Marxist Michał Kalecki, perceived the origin of this cycle in the contradictory interests of capitalism itself. In a crisis, business interests will not resist even massive interventions, provided they serve to maintain economic activity. But fundamentally they have no interest in seeing wages and costs rise, so when the crisis is over they rediscover their commitment to discipline and rigour. Keynesianism is thus condemned to exist for ever in the mode of stop-and-go. This bears on its intellectual history too. There is no unbroken continuity of Keynesian thought, even if as Mann shows in a brilliant series of cameos, despite their intellectual distance from Keynes himself, modern day economists of a reformist disposition, such as Thomas Piketty and Joseph Stiglitz, nonetheless reprise the sensibility typical of Keynesianism. Keynes was the paradigm, but was he the first Keynesian? Mann’s answer is bold. If Keynesianism is a constructive liberal response to revolution, a response that seeks to reorganise the social, political and economic order so as to address the tensions revealed but not resolved by violent upheaval, then the first thinkers of this type emerged in the wake of the French Revolution, and their godfather is Hegel. The alignment of Keynes and Hegel isn’t merely a historical claim highlighting particular parallels. The line Mann draws from Hegel to Keynes, and from there to the Keynesians of the present day, marks a boundary within liberal modernity. Keynesian political thought, like Hegel’s, is impelled by an apprehension of the deep tensions within modernity, a highly dynamic socio-economic system that perpetually produces poverty and crises that it cannot overcome, but which it contains by means of political ordering and reordering. Mann argues that we should read Keynes today as Marx read Hegel, as someone who was bent on maintaining the socio-political order, but whose thinking carved at the joints of that order. He then goes a step further. Hegel was ‘the first to fully elaborate a Keynesian reason, the reluctantly radical but immanent critique of liberalism that ultimately found its fullest and … most powerful historical realisation in The General Theory’. Hegel, in other words, was a Keynesian. ‘The effort to put Keynes (or Hegel) in his proper historical “place” – which would obviously rule out the idea that Hegel was a Keynesian – is a holdover from an age commanded by progress.’ In fact the essential similarity of the political problem addressed by the two suggests that talk of progress is illusory. Neither of them could find a way out of the impasse of a radical reformism that refuses the possibility of genuine revolution. It is an impasse in which we have been caught, according to Mann, since the conservative backlash against the French Revolution in the Thermidor of 1794. One of the things that makes Mann’s book so compelling is that he resists the easy gesture of calling for a radical supersession of that impasse. The activist, rationalist, crisis-fighting mindset of Keynesianism, he argues, is ‘not something that the left in the liberal capitalist North can just disavow at will’, even though conservatism may sometimes be the result. When the survival of the capitalist system is in question, as it was in 2008, the vast majority have too much at stake: we need the crisis-fighters. What’s more, as recent experience has shown, there are good reasons to defend technocratic government against the unreasoning passions of mass democracy. It is all too obvious today how important it is to be able to identify matters of potential technical agreement beyond politics, whether it is the size of the fiscal multiplier, the efficacy of measles vaccinations or the global threat of climate change. When we do so, we are back on the grounds of Keynesianism, engaged not in a totalising clash of values – denouncing ‘their’ reasons, ‘their’ truths because they are ‘theirs’ – but in reasoned arbitration over the proper boundaries of the political. What our current imbroglio reveals is that Mann’s highly generalised account of the ‘Keynesian sensibility’ across the ages doesn’t allow us to distinguish the varieties of technocratic reason. This isn’t just Mann’s problem: Keynes was aware of the ambiguity of his own position. As he remarked in the preface to the German edition of The General Theory, which appeared in September 1936, just as Hitler and Goering were announcing their Four Year Plan, ‘the theory of output as a whole, which is what the following book purports to provide, is much more easily adapted to the conditions of a totalitarian state, than is the theory of the production and distribution of a given output produced under conditions of free competition and a large measure of laissez-faire.’ Keynes had no sympathy for Nazism, but, as he clearly understood, the alignment of Keynesian macroeconomics with political democracy was an effect of Allied victory, not the result of an intrinsic intellectual or political affinity. The experts themselves must choose which side they are on. This makes for grim reading. But if we expand our horizon beyond what Mann clearly regards as the exhausted model of Western Keynesianism, it might not be grim enough. If, faced with fundamental environmental challenges, Keynesianism is reaching its ultimate limit, will it end with a whimper or a bang? Beijing faces the classical Keynesian dilemmas raised to a new level of extremity. Xi’s ‘Chinese dream’ is the most spectacular Keynesian promise ever made. The underlying fear of domestic unrest is palpable, the scale of repression is astonishing, but so is the gamble on growth. There is no counterpart in Western experience to the astonishing transformation in the fortunes of a population of more than a billion people in a matter of thirty years. But like any instance of rapid capitalist growth, China’s boom is fraught with danger. The country’s finances are highly unstable. The boom generates deep inequality at home, while abroad it incurs the envy of the United States, a declining hegemon with erratic politics and a track record of aggression. Added to which few places on earth experience the environmental costs of growth more acutely than China. Large parts of the country are at risk of becoming uninhabitable. The promise of growth is more real and more life-altering than ever. But so too is the possibility of catastrophe. Keynesians insist that we resist the blandishment of future calm to focus on the turmoil of the present. But on a rapidly warming planet, the waters are calmer now than they will be later. Just decades from now, a large part of humanity may count itself lucky if it is only in the long run that we are all dead.